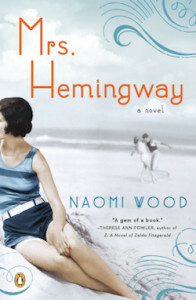 This unreservedly honest portrayal of Ernest Hemingway and his four wives is written in a unique style—a section for each, beginning with the end of the relationship and skipping back to key points in their lives and also connecting the women in nontraditional ways. Hadley, the quiet and reserved first wife (and only one not a writer herself); Fife, the misunderstood and passionate second wife; Martha, the exceptionally independent third wife, who was probably the least suited; and Mary, the gentle and understanding final wife, who watched her husband deteriorate, and had to make the decision on relaying the details of his death and take on the task of editing of his manuscripts and notes on living in Paris (published as A Moveable Feast). Curiously, all of his wives were born in the midwest United States, though he met them in far flung places. They were also on speaking terms with one another, sometimes commiserating on life with the difficult side of Ernest’s personality. This isn’t a story with a protagonist to cheer on; it is a raw and emotional journey of four women who loved a confounding writer the outside world viewed as fickle-hearted and increasingly irrational. Ironically, I picked up a 1953 copy of The Hemingway Reader at a library sale a few months ago. I’ve never read his works—I somehow got through high school without his novels on my required reading list—but love adding to my collection of old (pre-1960) volumes. However, the one that interests me the most—A Moveable Feast—was not yet published at the time of printing, so it’s not included in my book. Something notable I have discovered in my reading experience: Novels such as Mrs. Hemingway open the door for readers who may pass on certain genres, such as history, biographies or classic literature, and that is the beauty of historical fiction. I am now more inclined to take on one of Hemingway’s novels sooner rather than later!